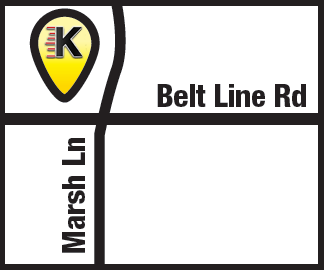 Kwik Kar on Marsh at Belt Line provides power steering service. Power steering fluid is one of the most overlooked automotive system fluids in a vehicle. It loses effectiveness over time, risking steering system performance and ultimately failure that may cost upwards of $1,000. Kwik Kar’s Power Steering Service helps to provide optimal steering efficiency and extend the life of the power steering components. Many vehicle manufacturers recommend a Power Steering Service every 30K miles. Over time, the seals, O-rings and internal power steering components will wear out. When they break apart, they contaminate the power steering fluid, which forces the power steering pump to work harder and eventually break down. Use a synthetic blend of power steering fluid that maximizes performance over a wide temperature range. Schedule your appointment Click Here.